Chomp from the Little Jurassics collection is back with his high-energy and lovable personality. This time around, he is ready to soothe baby's gums. Made from 100% silicone, Chomp is a durable, food-grade teether and is dishwasher safe and able to stand up to even the most rigorous baby chewing. 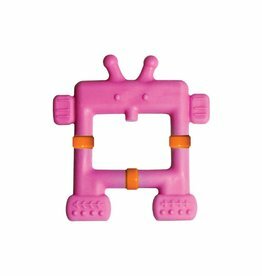 Easy to grasp, with multiple textured teething surfaces, Chomp will satisfy even the fussiest teething babies. Chomp can also be safely refrigerated to soothe sore baby gums.